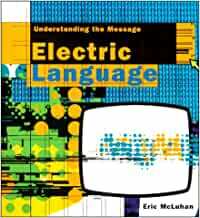 Marhsall McLuhan`s son, Eric, presents a collection of essays on the ever-changing world of media that represents the new modes of expression. Color photos. It is brilliant, witty, insightful, clear. Worth every penny. Recommended withouthesitation! 1.0 out of 5 starsEssay . . . Sorry, I just don't get it. This book is a long poetic essay about writing styles in the electronic age (I think). It's rather experimental in format and probably couldn't have been published by someone without a famous name. Open it to the table of contents, and you find a page half in pale orange and half in neon green, with white double-grid lines across the page, sort of in a plaid pattern. The table of contents itself is only in one typeface (2 sizes) a remarkable phenomenon in this book. As for the content of the writing, it touches on topics such as virtual reality, teleconferencing, the split of Serbo-Croatian, writing systems of the world, new styles of writing, and synesthesia. If you like reading long-winded philosophical essays written as graphic arts experiments, then this book is for you. 5.0 out of 5 starswhy OJ & Clinton make us feel so ill, or should. Let's try this again. This book seems especially pertinent after the Starr report and its resultant cultural hangover. The issue is the utter loss of consensus at what constitutes the boundary of public and private behavior under the influence of electric media; and where there is no consensus, there is no privacy. America, once the bastion of individualism and private identity, is sick with the mixing of public and private things, perhaps the final gasp of literate detachment, and a clear sign of the corporate identity McLuhan predicted two decades ago. This book offers insight and playfulness as an anti-toxin. A wonderful book by Eric- a must read for anyone interested in the media. He's also a great guy- he taught me media and perception- I haven't been the same since. Read it and expand your mind!